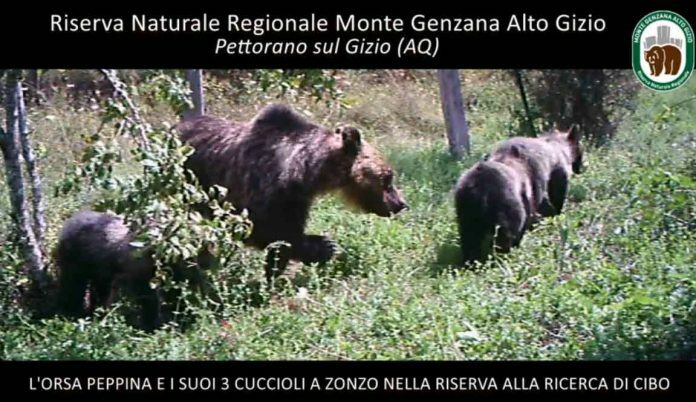 In the authentic spirit of the Bear Smart Community and a responsible ecotourism – able to enhance natural resources without being a threat itself to the environment – the Monte Genzana Alto Gizio Nature Reserve and the municipality of Pettorano sul Gizio did not give a permit for a night bike tour organized by ASD Miramonti Free Bike on Friday 7 December 2018. In November, the Reserve signed an agreement with the hunters of the Sulmona Territorial Hunting Area (ATC)​​ to exclude from their hunting activity a part of the territory in which it would have been allowed; denied the cutting of a wood particle, with the counter-proposal to authorize cutting in another parcel, and closed two forest roads with gates and boulders, thanks also to the financial contribution of Salviamo l’Orso. All these measures aim at avoiding any kind of disturbance to the Marsican bears, including Peppina and her three cubs, in areas of vital importance. We thank the Reserve and the Municipality of Pettorano sul Gizio for their right decision, and the ASD Miramonti Free Bike and ATC Sulmona for their availability and awareness.